I'm usually not one to step in front of freight trains. 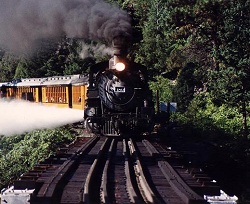 Especially when the train is as dense as gold. But we are seeing some signs that $GLD has reached an intermediate term top. 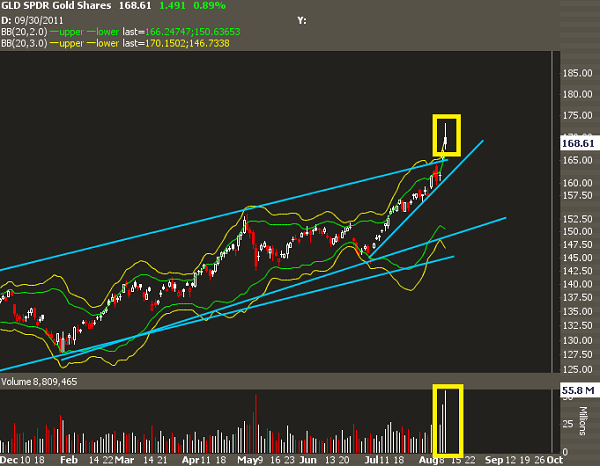 First chart is $GLD, the gold etf. We also have the 2nd and 3rd standard deviation Bollinger Bands on top of price. Bollinger Bands are an adaptive volatility study that gives us an idea of where price should trade as well as if we're in volatility expansions or contractions. Yesterday we saw $GLD trade higher than its 3rd standard devaition Bollinger Band. We also see how it's cleared a longer term uptrend line and that price has "accelerated," with new trendlines of steeper and steeper slopes. We also saw the largest volume traded in quite some time, so this all leads to the idea that we are reaching parabolic exhaustion or some form of a blowoff top. But price alone, in my opinion, is not the only thing to watch. Enter $GVZ. 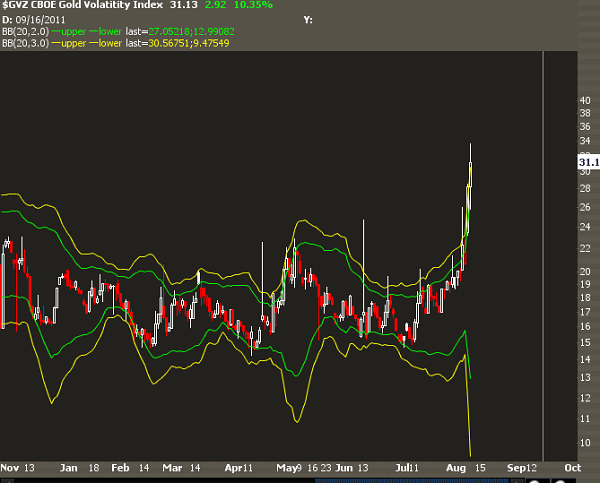 The $GVZ is to $GLD as what the $VIX is to $SPY. 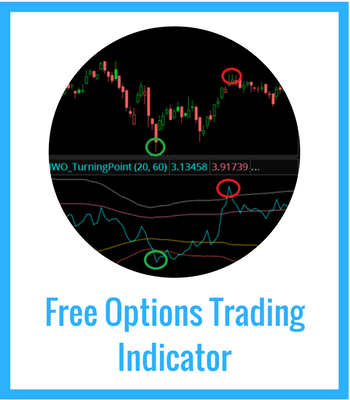 It measures the supply and demand of $GLD options. But the difference between the two volatility readings is where the "fear" originates. For equities, there is fear of the downside. But in commodities like $GLD and $USO, there's often fear of upside. $GVZ too has seen a strong move. It closed outside it's 3rd standard deviation Bollinger Band. But it did so on a price spike. What does this mean? Investors often view $GLD as a risk-off trade. When there's geopolitical uncertainty and debt voodoo going on, many will buy $GLD as it's the "true currency" - or something like that. But when we see spikes in $GVZ accompaning the up-move, it often means that the fear is running entirely too hot. Historically, this has led to intermediate term tops in the gold market, followed by a few months of consolidation. Does this mean the secular bull market in $GLD is over? Hardly. It just means that from a risk/reward standpoint, longs don't make sense right here. And the signal could turn out to be completely wrong, so risk management, execution, and position sizing matters here. Because this is a gold-plated freight train, be very picky about how you short this if in fact you do want to fade it. 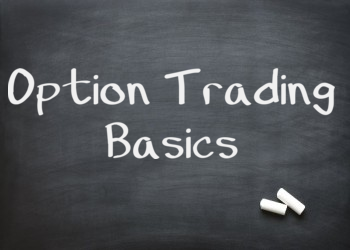 Options can help you do this, and there's a variety of ways to play it-- call ratio sales, put buys, calendar buys, and so on. 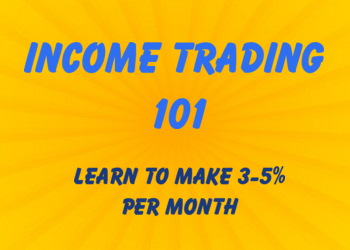 If you want to learn how to best structure your risk, I can help.